So let this be my PSA to all pet owners: Have an emergency treatment plan, including an at-home pet first aid kit, and readily available phone numbers/addresses for all possible care providers. Get information from your vet about dosages of over the counter meds that you can have on hand to treat your dog, and know what you will do before an emergency occurs. back to the other part of living that has been getting in the way of full effort blogging - having fun with friends! Last weekend, I had the immense pleasure to host a HouseParty for Shutterfly. Shutterfly is my go-to site for making photobooks, ordering prints of Doug, sharing photos with family, and making yearly holiday cards - so I needed no reason to have my girlfriends over for an evening of wine, yummy snacks, giggles, making photobooks/cards, and sharing our recent memories through pictures. And I had so much fun sharing my love of Shutterfly with my girlfriends at the HouseParty, that I want to share the love here on my site too! The first 5 commenters to leave their email address and "CARD" will get a code for 10 free Shutterfly cards. The first 6 commenters to leave their email address and "BOOK" will get a code for a free 8X8 Shutterfly photo book. 40% off cards & calendars with code "HOLIDAY"
40% off photobooks with code "BOOK40"
FREE shipping on $30+ orders with code "SHIP30"
Oh, and Shutterfly is so awesome, you can STACK your promos! Trust me, you mother wants a photo gift from you this holiday season! Love that top with that fun belt! Glad to hear your dog is ok, that's scary!! And also...you look super great in those jeans. Just thought you should know. Book! That would be awesome. It's on my 30 before 30 list to make one of our first year here in San Francisco. So glad to hear Doug the Pug is okay!! I had the same thing happen to my pug Mitsou. When she was a puppy she reacted to her vaccines, so we stopped vaccinating her. Then when we moved to Toronto the vet assured me that she would be fine to get vaccinated so we did. About an hour later Mitsou was like Macy's Day Parade balloon. I was driving around in a panic trying to find a vet emergency that was open. When I finally found one they wanted to give her a tracheotomy! Thankfully after an injection the swelling came down, but from that day forward, Mitsou was never vaccinated again. She lived to the ripe old age of 17. RIP Mitsou. Oh my gosh, I'm glad Doug is okay! Hope the meds continue to work and he's back to his regular self. 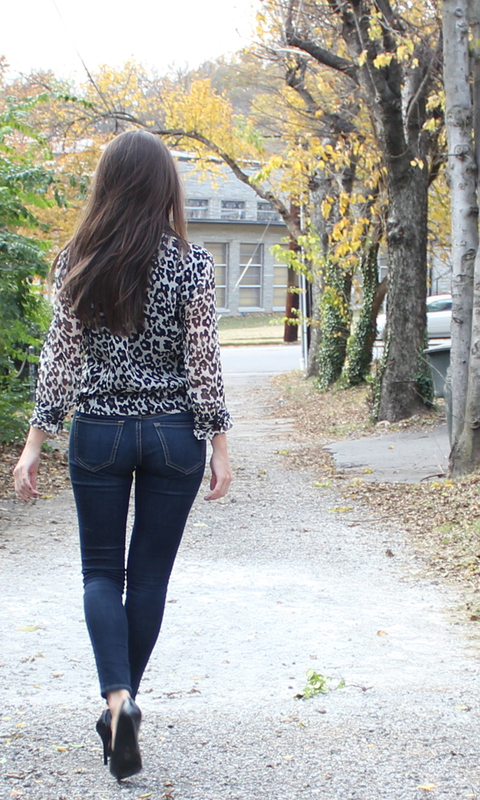 Love your sassy leopard top! I always use Shutterfly for my holiday cards! CARD and box.lindsay@gmail.com :) Glad your doggie is ok! Adorable pictures of you and your friends! I hope Doug feels better, when pets get sick its the scariest thing because they cant tell you how they are feeling!!! And you look great in this outfit, your hair is so pretty, I am so jealous! BOOK! I love Shutterfly and their photobooks are such great quality! You look amazing, I love that leopard top! So cute! Cute look - I love your top!! Your shutterfly house party looks like so much fun!! If there's one still available - book! thejenndaily[at]gmail[dot]com :) Thank you!! Looks like it was a lot of fun! I have yet to try Shutterfly, but I'm thinking of ordering a photobook pretty soon. Love your leopard blouse and neon belt! What a scare! I'm glad little Doug is on the mend! I love the pop of neon you added to your look! Glad to hear your dog is okay! I think we definitely need to get an emergency kit ready for all of our animals! Cute look! Loving that leopard blouse!! BOOK! Thanks for the opportunity! And sooo glad Doug is doing better. Phew! I'm glad your pup is okay!! Although I love blogging, it's nice to relax about it every now and again to have some fun :) You look great--I love the leopard blouse with the neon belt! May DtP is allergic to eggs too (from the vaccines)! Poor little guy!! And Doug officially has a new nickname - DtP is awesome!